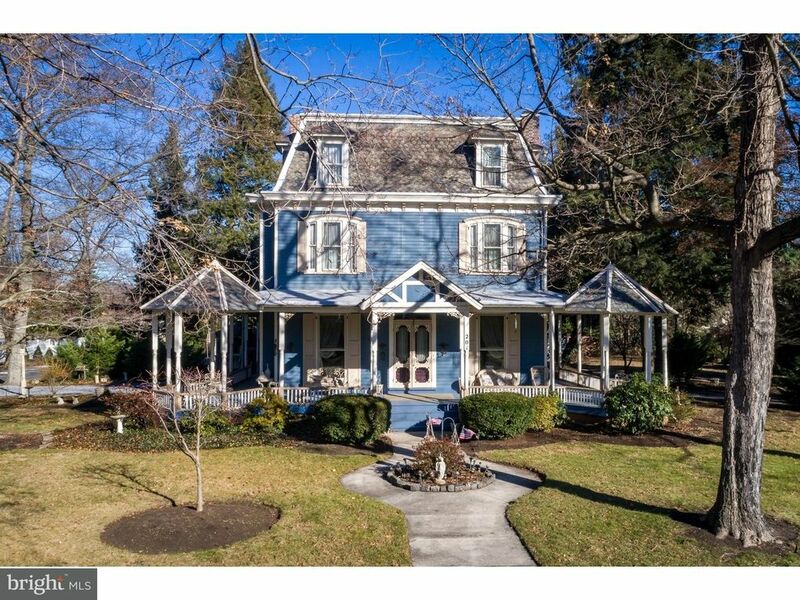 Exquisite 1868 Victorian home, lovingly restored to it's original beauty and tastefully updated to include modern amenities. The breathtaking wrap-around porch invites you to spend some time catching up while the spacious paver patio offers a tranquil place to pass time with family and friends. Once inside, you will be swept away by the soaring 12' ceilings that are adorned with ceiling medallions, crown molding and custom plaster work. This home is full of historic character to include original hardwood floors, period specific lighting and decor, stained-glass windows, arches and transoms, 10' windows and doors, pocket doors, original hardware and restored fireplaces that have been converted to gas. Each room on the main floor tells a story of the past from the inviting living room/parlor to the dramatic dining room, the music room to the splendid great room. The renovated kitchen has retained historic accuracy by first passing through the butler's pantry with prep sink and storage for china and linens. Creamy white Thomasville cabinets are accented with an antiquing glaze enhancing the detailed woodwork and trim. The tumbled stone backsplash and granite countertops, tiled floors, tin ceiling and fireplace are the perfect touch. Upstairs are the sleeping quarters with five bedrooms, all with wood floors, and two vintage-inspired full bathrooms with marble tiles. The gracious master suite offers built-in storage, an electric fireplace, tongue and groove ceiling, crown molding, and an incredible en-suite bath with shower. The guest bedrooms are all spacious and have kept their charm with original floors, hardware and woodwork. The third floor has three additional bedrooms, an efficiency kitchen w/laundry, full bath and sitting room. There is a private entrance from the side of the house, making this perfect for a nanny suite. In the rear of the estate, you will find a rentable Carriage House with two bedrooms, renovated kitchen, full bath, sitting room and great room. This would be an ideal space for an in-law suite or artist's cottage. There are three separate electric meters for each living space as well. With it's tree-lined streets, grand homes, historic charm, Blue Ribbon schools, and proximity to the river and yacht club, Riverton is a great place to live. Words alone cannot do this architectural masterpiece justice, it must be seen to be appreciated. Bonus: Home has been freshly painted and a brand new efficient heater has been installed.